Now switch to Recipients tab. The list of recipients who will receive alerts is defined here. 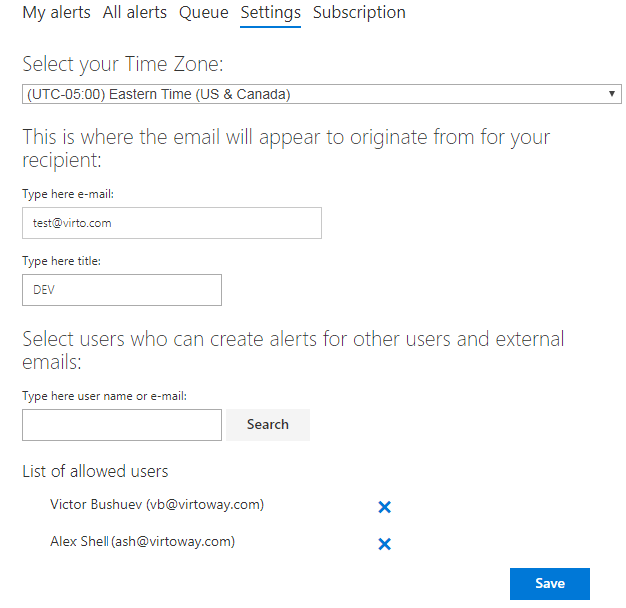 Your must have administrators permission to send alerts to other users. If you have the administrator's rights, there are several options of recipients’ selection. The first option is Set of users or e-mail addresses. You can start typing the username and get suggestions with an autocomplete option. The second option is Me. In this case, the alert's email message will be sent to the user who has created this alert. Click on users’ icon next to the recipients’ field to display the dropdown menu with user fields of current list. In the following example, these are fields Assigner to, Created by, and Modified by. This option is used when it is required to organize alerts sending to users taken from a specified field. For example, it can be used if you need to send alerts to users assigned to work with a task. Select “Assigned to” field and send alerts to users from according field of the chosen list. You can assign multiple recipients in this field and select both recipients from a field in the Alert list and recipients with emails. In this case you will send them all the alerts.